While Israeli Prime Minister Benjamin Netanyahu praised Trump’s “courageous” decision, Arab and European leaders reacted with fury and concern—warning it could spark a wave of violence. 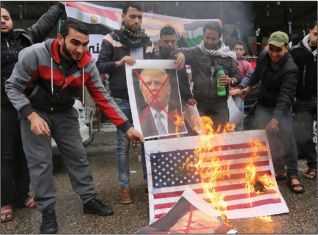 Palestinians burned effigies of Trump in the West Bank, and in Gaza the Islamist group Hamas called for three “days of rage.” Trump’s declaration came as his son-in-law and adviser, Jared Kushner, pursues a peace initiative reportedly crafted with Saudi Crown Prince Mohammed bin Salman. Palestinian diplomat Manuel Hassassian said Trump’s declaration amounted to a “kiss of death” for that effort.